Brexit and a blackhole - two major news stories in Brussels this week, not related. But it might seem like Brexit is becoming an inescapable political void, and many want it to disappear over the event horizon. Instead the special EU summit moved the leave date to October 31st. Brexit could be delayed further, if the British Parliament does not find a withdrawal deal worth voting for by then. While one member edges slowly towards and exit, another country is perennially an outsider: Turkey. It is also at odds with Brussels. The country's right-wing populist strongman, Matteo Salvini, made headlines this week by starting to cobble together an alliance of nationalist parties across Europe. But at his official launch, only three groups showed up – ironically from countries where right-wingers are polling below their expectations. That could harm Salvini's effort to make a strong impact in the next European Parliament. For many politicians, there is a long way to become a member of the European Parliament. You need strong convictions, the power of persuasion and stamina, not shying away from long-term goals. Our colleague Sandor Zsiros has it all. He is the consummate Brussels and Strasbourg insider. Now he wants to find out how it is like to travel between these places on a bike. We will catch up with Sandor on Monday. On Monday, the United Nations Security Council debates the situation in Yemen. Also on Monday, the EU Agriculture and Fisheries Council meets in Luxembourg. The roundtable focuses on environmental challenges – among them plans to achieve zero net greenhouse gas emissions by 2015. And speaking of climate challenges: Swedish activist Greta Thunberg will be at the European Parliament in Strasbourg. This week it's more of a sartorial statement than a verbal one. 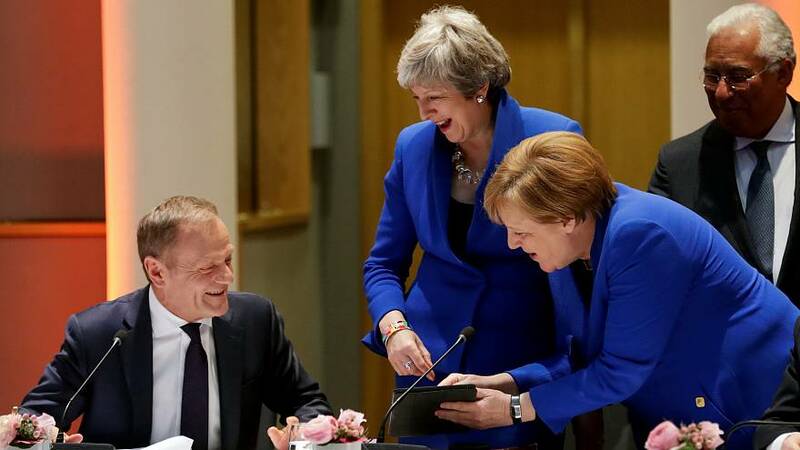 Angela Merkel and Theresa May having a light moment when they realized that they had both adressed their respective parliaments earlier in the day in the exact same color – European blue.